The MCP filter is specifically designed for pyrographers and removes any dust and smoke fumes caused by the machine. The MCP has two filters placed in a cardboard cartridge which are quick and easy to change. 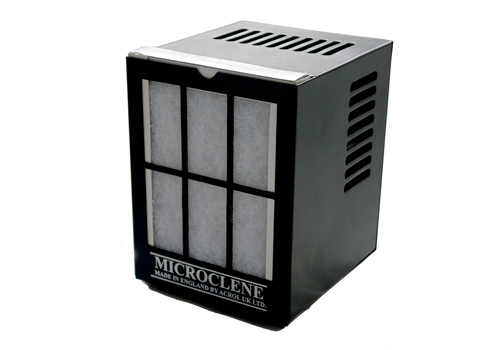 It contains a EU4 dust filter and a high quality activated carbon filter for fumes. The filter sits on a work bench with the filter facing you. Place it on the other side of the workpiece and it will draw the dust/fumes away while you work. The MCP is very small at 200 x 150 x 125mm (8 x 6 x 5in) and is constructed of steel and powder coated for a long life. It has a 25W backward curved fan that is very quiet in use, and the expected life of this motor is 40,000 hours - that's 8 hours a day, 5 days a week, for 20 years. It has a 2 metre power lead and an on/off switch on the rear. Available from all international Microclene retailers.